Inside the taxonomy – Jonathan Porton, specialist in User Information Architecture gives an insight into developing a new taxonomy with the user in mind. This month marks the end of a major piece of work to improve the navigation and findability of our content through the introduction of a new ‘Browse by theme’ taxonomy for the ONS website. 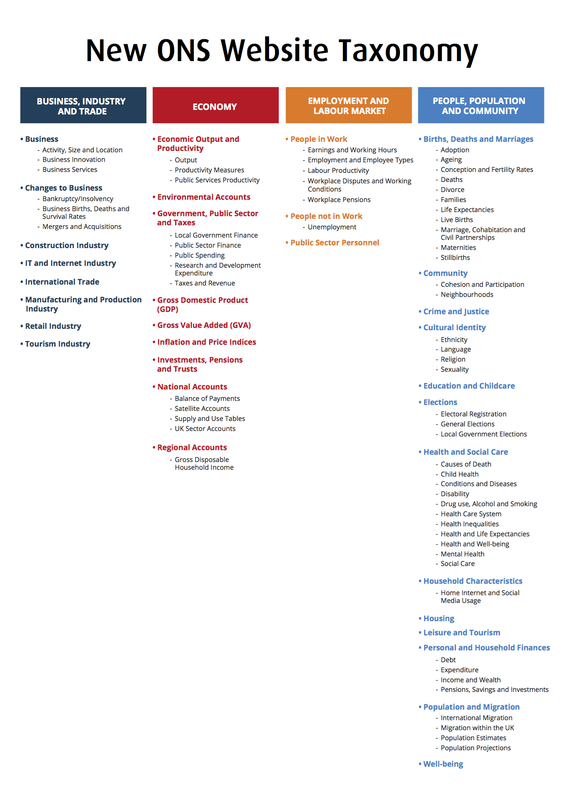 Currently, the website’s taxonomy is based on the National Statistics Category List (NSCL) used by statisticians to categorise their statistics. However it was never designed with a website in mind, nor was it a good fit for the ONS statistical release portfolio. Driven by user feedback around their inability to find or access our statistics using the current taxonomy the Digital Publishing team embarked on a project to redefine it and what better way than by asking our users to create it. So how did we approach it? The first step was to review our existing taxonomy to see what was there, what was missing and, most importantly, how our users were interacting with it. We did this by looking for patterns within our web analytics, reviewing every single item in the taxonomy (over 1400 and 5 levels deep) and by reviewing hours and hours of video taken from our previous usability studies. Armed with this information we then asked a range of users (around 200 of them covering a wide range of demographics; economists, media, academics) to perform a card sort test. Our users were presented with around 40 cards with topic names on them and asked to sort them into groups (themes) that were logical to them. We took a section of these users and facilitated the test asking them to talk out loud whilst completing the test to understand their reasoning. We then analysed the results, highlighting topics where user opinion was split as to where they should be grouped and formed a new taxonomy. To test the new taxonomy, which had been protoyped, we then performed a series of tree tests. In this test the user is presented with a series of tasks related to finding our statistics and asked to navigate the raw taxonomy, marking where they would expect to find this statistic. Again, a number of users were interviewed whilst completing these tasks to further understand their reasoning and motivation. At the end of each day the taxonomy would be revised based on feedback and presented to new users the following day. In line with our user-driven approach we also asked a number of users to perform the same tasks using our current taxonomy to give us comparability. In total over 130 users took part in the tree tests and the results clearly showed our new, user-driven taxonomy out performed our existing one. According to his study, Measuring Usability Jeff Sauro, usability expert and statistician sets a satisfaction benchmark of 78% for user testing. The average success rate across all test 2 versions was 86%. It took users half the time to complete the tasks and our task success rates were almost 30% better than that of the existing taxonomy. The new taxonomy reduces the number of themes from 11 to 4 making it more relevant to the statistics we produce. This follows other National Statistics Offices; Australian Bureau of Statistics has 4 themes, German Federal Statistical Office 5, and Ireland Central Statistics Office 5. Feedback from participants shows the new taxonomy to be intuitive, making it quicker to find the content, although the user experience needs to be improved once they find what they are looking for. Naturally, there is some crossover of statistics that cannot be avoided as certain subjects mean different things to different people. Overall the project has delivered its goal to develop a user-driven navigation which provides access to content quickly. We’re not saying it’s perfect by any means, in fact it’s probably impossible to create a taxonomy that satisfies everyone due to the multiple ways humans categorise subjects but we think we’re almost there and the plan is to monitor user feedback once it goes live and review periodically. Future enhancements will look into fixing other issues including our search function and home page design, but for now we hope that our users will no longer find our taxonomy taxing. Great stuff! How long did it take you to do this, end-end? Nice work, Jukesie! Downloading the full report to have a good nose through everything.